In a partial bid to revive the near-dead Palestinian track of the Middle East peace process, Israeli forces have ceded greater control over four key areas of the West Bank to the Palestinian Authority security forces. These areas are Qalqiliyah, Bethlehem (Bayt Laham), Jericho (Ariha) and Ramallah. This will be the first time Palestinian forces will operate completely without Israeli oversight. This will be a test of two things: can the Palestinian security force maintain order on their own in the larger cities, and will those forces be able to prevent terrorist attacks into Israel proper or Israeli settlements on the West Bank? If they cannot do either of these things, the Israelis will not countenance the establishment of a Palestinian state with any kind of sovereignty. To put his into some context, let's take a look at one of these four cities - Qalqiliyah. I was recently in Israel and the West Bank, and had the opportunity to visit the areas on both sides of the anti-terrorist barrier in and around Qalqiliyah - these are photos from that trip. As you can see, Qalqiliyah sits on the de facto border between Israel proper and the Israeli-occupied and West Bank. The blue line is the anti-terrorism barrier, comprised of a combination of fence and wall. It separates almost the entire West Bank from Israel proper and the Israeli settlements on the West Bank. The city of Qalqiliyah is considered an "A" area, where the Palestinians exercise control and exclude Israeli civilians from entry. "B" areas are jointly controlled by the Israelis and Palestinians, but generally closed to Israeli civilians, and "C" areas are exclusively Israeli. 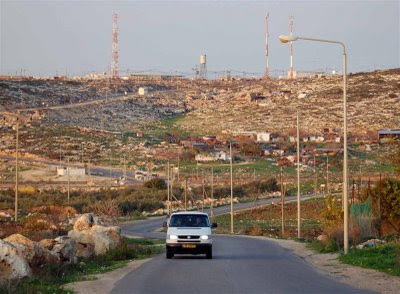 The Israeli army can operate in all areas, but refrain as much as possible from entering "A" areas. 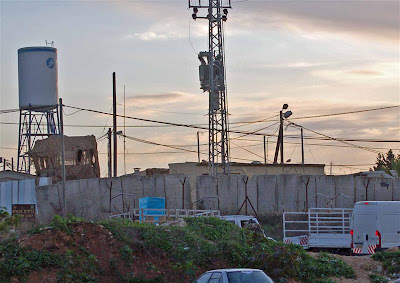 In this picture, the Israeli army barracks (5) is at the top of the hill, with the antennas and water tank. The Israeli control point (1) is seen above and to the left of the white vehicle. The picture was taken from in front of the Palestinian checkpoint (3). This is the Palestinian check point facility (3) at the road junction. 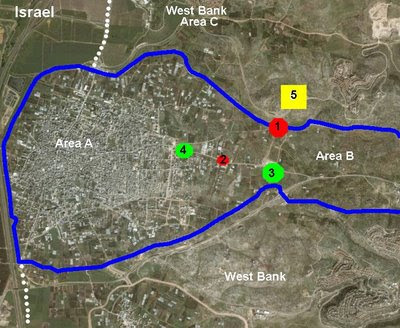 With this new arrangement, the Israelis will remove their checkpoint (2) on the road after the Palestinian checkpoint (3) and before the Palestinian checkpoint (4) at the entrance to the city. Israeli forces will still mount patrols (above) on the West Bank. 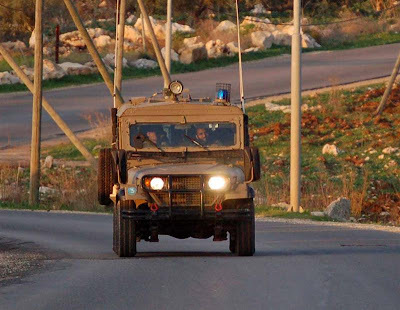 This patrol is approaching the Palestinian facility (3) at the road junction. This is a good first step. If the Palestinian Authority can prove that they are up to the task, especially in preventing terrorist attacks against Israelis, there may be hope for continued progress toward the establishment of a Palestinian state. Most of the problems in the region hinge on that one issue.